Honestly, how many extreme bands from Wales do you know? Not many, huh? We have one of the leaders of Welsh underground, great and perverted DESECRATION!!! Death Metal with high quality grindcore ingredients is served by these gentlemen. Started as early as in 1992 with their first big album titled „Gore and Perversion“ from 1995 to put this band on a black list by the local authorities due to its very scandalous content. The guys, however, go on releasing more and more recordings the latest of which is a great musical effort called „Cemetery Sickness“ from 2014. DESECRATION are very experienced guys as you can find members of Onslaught, Extreme Noise Terror or Hellbastard among the band members!!! 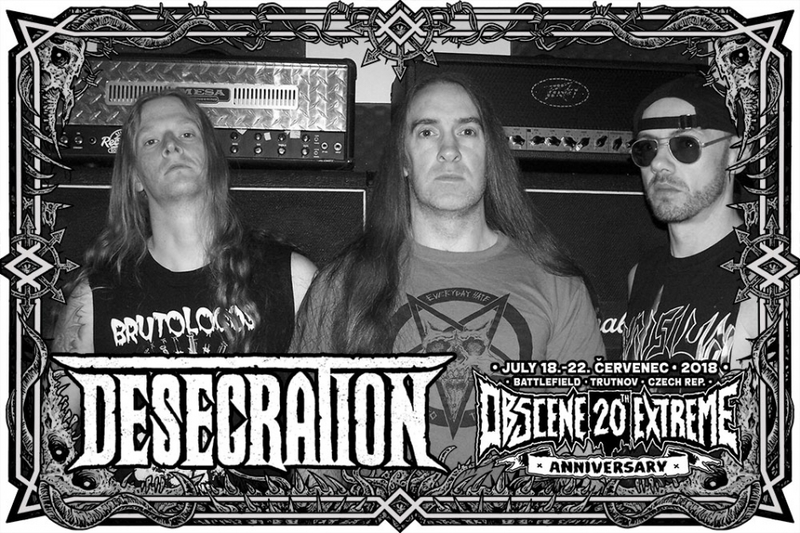 DESECRATION at OEF 2018!!! Formed in 1992, and releasing their first demo in 1993, Desecration caused controversy in 1995 when their debut album Gore and Perversion was infamously seized and incinerated by the local police due to the album's offensive content, and banned upon release. Since then they have carried on with their ferocious death metal, reaching as many corners of the globe that they can get their bloody hands on. Their seventh album 'Cemetery Sickness' was released in 2014 and the band are actively touring to support it. Featuring members of Onslaught and Extreme Noise Terror. Keep an eye out for them coming to a town near you.